Today marks the anniversary of the 2017 Catalan referendum that failed to form an independent state with several pro-independence Catalan politicians jailed and currently in pre-trial detention in Catalonia's penitentiary institutions. Protesters are barring major roads, train lines and parkways across the northeastern region of Spain. 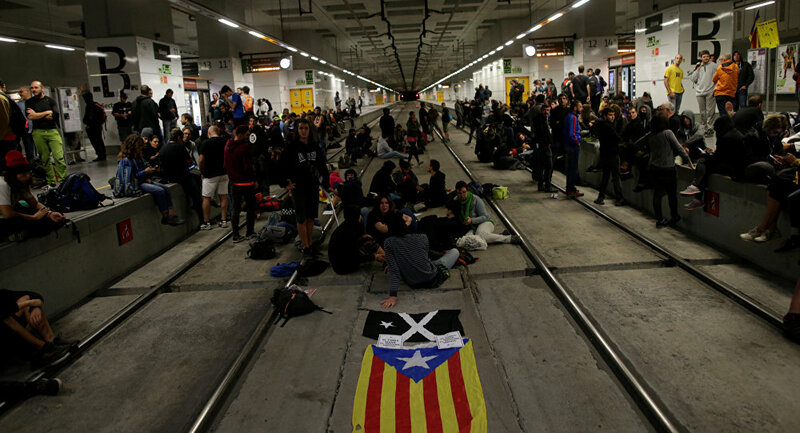 Regional police have tried to prevent hundreds of protesters from occupying high-speed railway tracks and stations, according to the local media. The AP-7 highway, the main road along eastern Catalonia leading to the French border, and the central streets in the cities of Lleida and Barcelona, the regional capital, have been reportedly blocked by protesters using tires to form barricades. — Gemma_Encabronada (@luana80668984) 1 октября 2018 г. Photos of the protests have been shared on social media platforms. — CDR Camp de Tarragona (@CDRCampTGN) 1 октября 2018 г. — Arran Tarragona💡 (@Arran_Tarragona) 1 октября 2018 г. In September, clashes between pro-independence protesters and the police occurred in various places across Spain with dozens of people injured. About 90 percent of voters supported Catalonia's secession from Spain in the October 1, 2017 independence referendum. On October 27, 2017, the Catalan government proclaimed the region's independence, however, the Spanish government refused to accept the results of the referendum and imposed direct rule over Catalonia, dissolving the Catalan parliament, stripping the local government of power and issuing arrest warrants for Catalan politicians.